Since I had my little MAN back in 1999, I’ve loved little trucks with big cabs, not just standard sleepers. Most are engaged on interesting and or long distance work and like mine used too, often clock up as miles as their bigger brothers and sisters. I have now started a new Facebook group called #littlebigcabclub purely for the big cab versions. 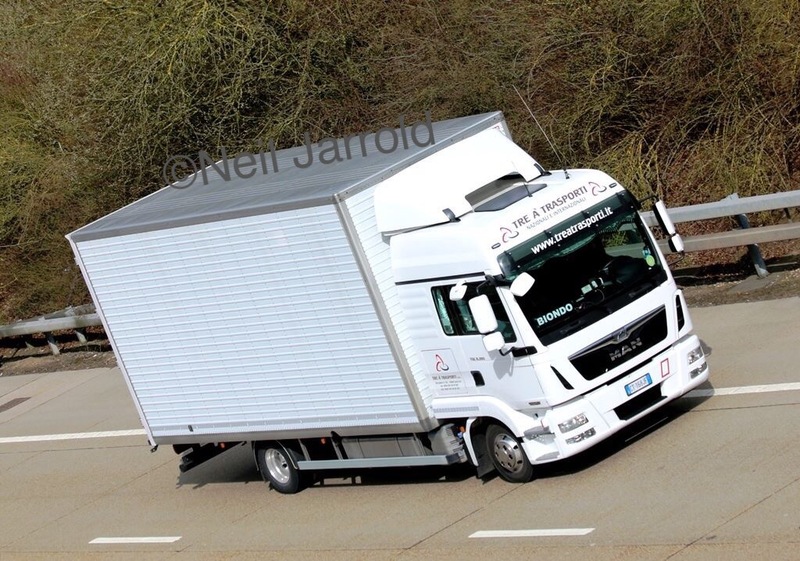 Manufacturers offer big cab sleepers such as Iveco, Mercedes-Benz or MAN Straight from the factory, the rest need one of the many aftermarket options from UK or European suppliers such as Hatcher Components, KUDA, Spojkar or PONY. 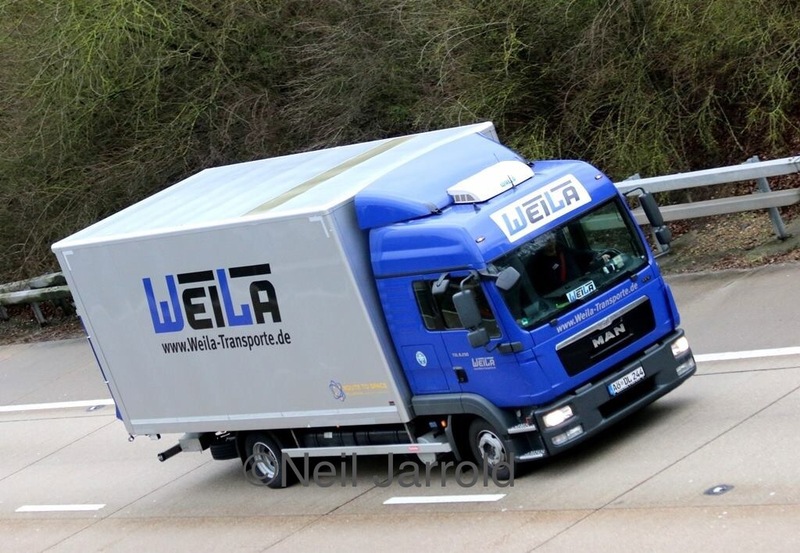 “Hello, she is one of our growing fleet, we have 18 trucks with various sizes from 7.5 ton trucks to 45 ft Mega trailers. 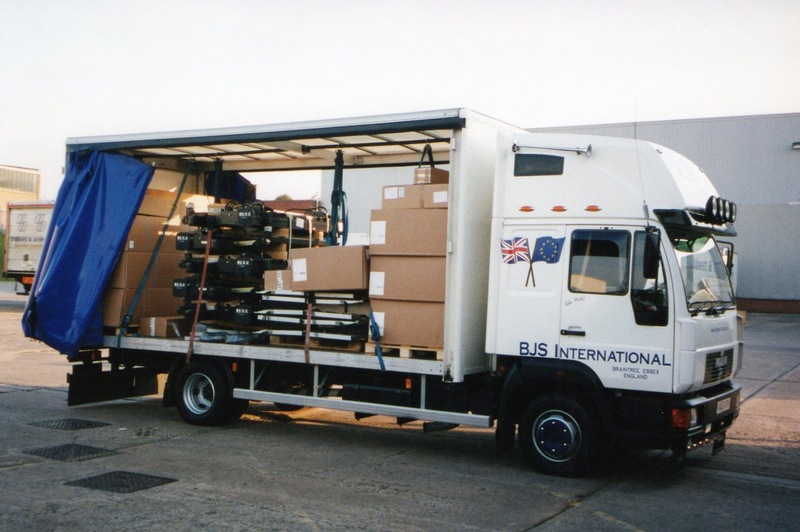 We supply trucks for events all over the UK and Europe. 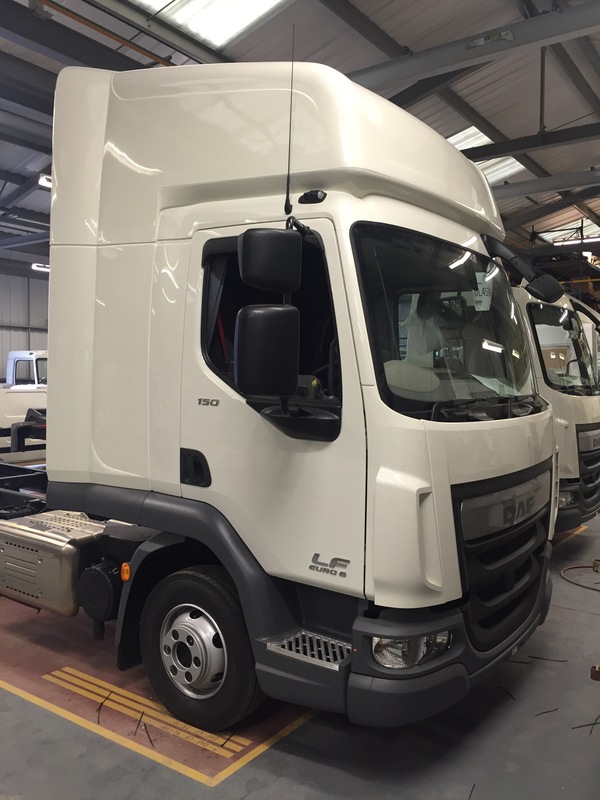 The 12 tonner which you have seen is new to our fleet and therefore doesn’t have a private plate and is not sign written yet. She will travel throughout the UK and Europe delivering Audio visual and lighting to corporate events or exhibitions. It will also go to festivals and arenas plus private events etc. 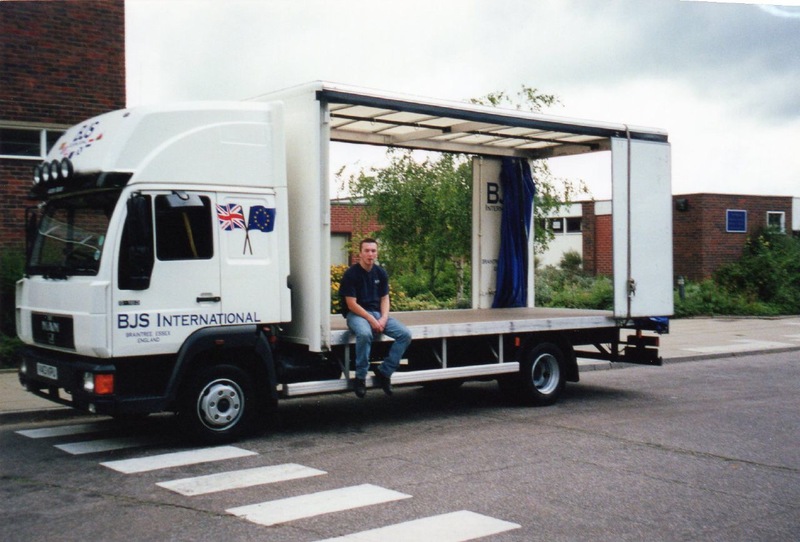 We are now 10 years down the road here on the blog and if there are any of you first blog readers still here, then it’s time you…….no no, then most of you will know that I love a little truck with a big cab and the icing on the cake is one that does international work! For me the perfect example are the two little trucks you see above. 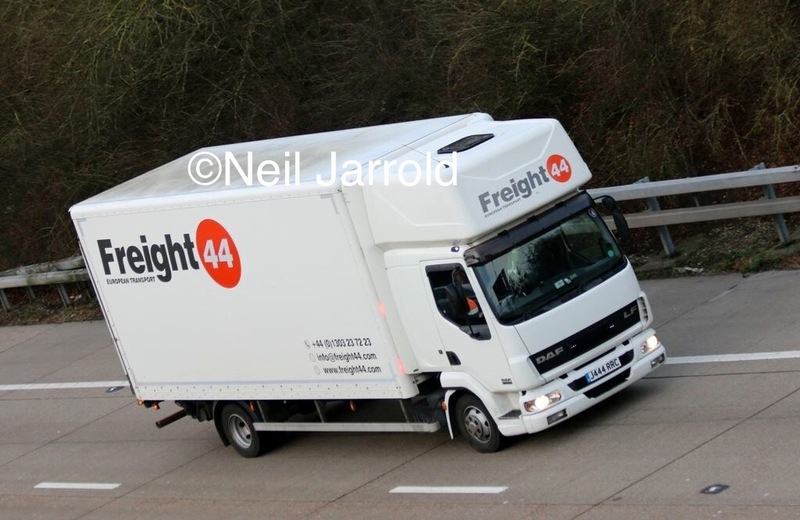 A good pal of mine spends many a Wednesday doing what we’d all love to do, he stands on a bridge over the M20 in Kent photographing all the trucks, mainly those heading to or from the UK’s main link with Europe, Dover Docks. All of the photos in this blog are all taken and copyright to Neil Jarrold. Without Neil I’d struggle to see quite so many of these delightful little motors from my office in Ipswich! The little Italian TGL LX above just oozes something that flicks my switch, big cab, smart paint, tidy bodywork, big fuel tanks and foreign number plates! You could get me into that truck and send me to Italy everyday even if you offered me tractor and trailer instead. Bellissimo. 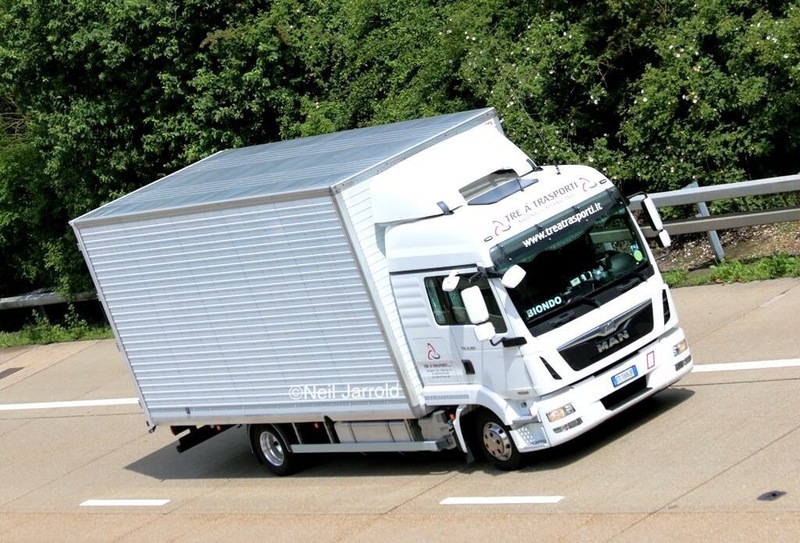 So it needs a big cab, it needs to be international and the only way to hit perfection is add on a little fridge body. Bingo!! I know the little Pulleyn Ategos used to go far and wide hence the TIR board but once again the little MAN just looks the ticket. 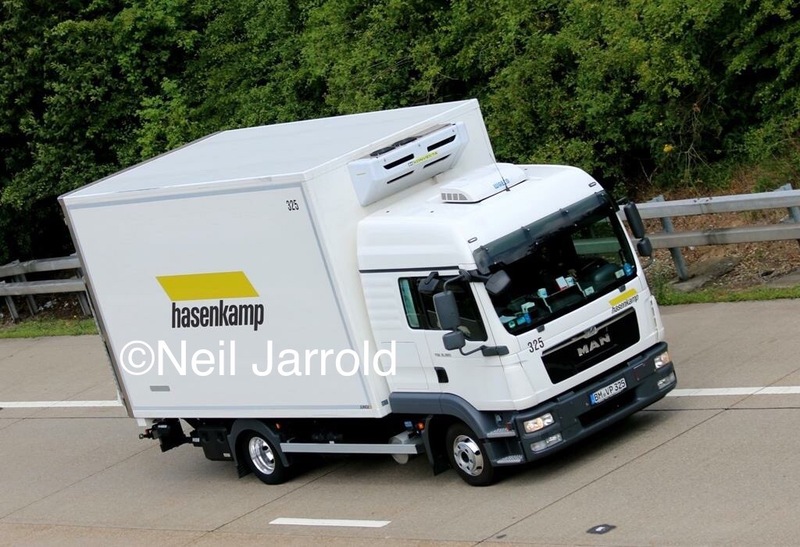 Maybe as I had a little MAN 7.5 tonner I’m a little biased but the little German is the best thing in the MAN range by a very long way. How about a little DAF? 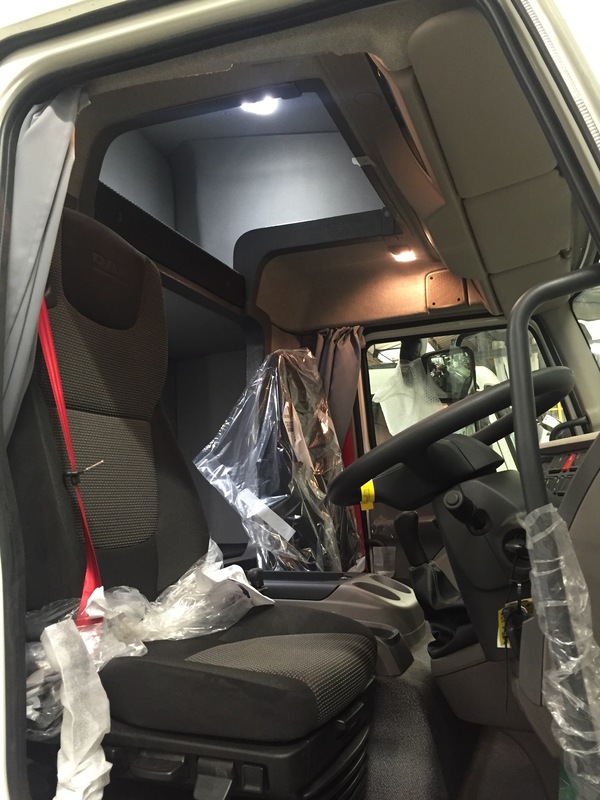 Well the small problem with the LF is that they don’t do their own big cab, you need to look for an aftermarket one. A local company to me Hatcher Components do a marvellous twin bunk “Sky Cab” conversation for the little Dutchman and I have to say it is once again rather splendid. Painted properly the DAF is as gorgeous as it Dutch roots, a real head turner. I still don’t really get why I like them quite so much, even a mini artic does the trick and has that certain, Je ne sais pas quoi. The one thing I do know is, every time I see some of Neil’s photos capturing their journeys doing as many miles as any of their bigger cousins across Europe, it always makes me want to get back to it. As I have certainly said before, if I’d managed to stop in my little MAN and actually speak to another now friend of mine, Steve Marsh, then just perhaps I could still have my own little big cabbed truck. I like it when I get talking to some of you lot and I often get the impression we could be talking about any hobby or passion. Some of you like heavy haulage, some tippers, some Foden’s and I guess for me, my “speciality” is little big cabs. But then again as with anything, variety is the spice of life and trucks are no different. I’d be a boring old truck show if we all liked the same thing! Thanks to Neil Jarrold for the photos. The Golden Days with a SuperMAN! Watch out it’s going to get rather romantic I think! I wasn’t about in the golden days of trucking I was a mere ankle biting pain in my parents backside. As a lad and as I’ve told you many times before I longed for my driving licence and to be heading off to far flung places but I admit my golden days are very different to the general term of the 70’s and 80’s and also very different to everyone’s own good old days. No matter your age, country or work, if you’re a driver you’ll have your own favourite job, workplace and truck. Not necessarily your first or last, or even the most expensive but the one job you’ve loved, the job that made you think; “I love my job!”. I maintain to this day that if you haven’t had at least one day like that then more fool you for doing a job that underneath it all you don’t enjoy. For me those days were the second truck I owned as an owner driver at the tender age of 20ish, an MAN 8.163, 7.5 tonner. The little German really earned her keep. No speed limiter back then meant there were plenty of days that packed the best part of 1000km into my “10” hours driving. I’m no hero and don’t claim to be a nonstop 24 hours a day at the wheel type, but most of you at some point would have and probably have found the old fashioned ways of bending the rules to get a job done, or to get you to a load point or even home. This little lorry never let me down and got me to different places day in day out. Various jobs entrusted to me meant that I was the only truck on the job and often I’d have deliveries to the same destination one week and then onto another project the next week. Maybe Braintree to Cheltenham and Gloucester and back. Maybe Chelmsford to Swindon and back. May be three days of Braintree to Carmarthen and back. 270 miles one way, that’s 4.5 hours at 60mph. I could just about do it in 9 hours and I think the worst day was a 10 hour drive. Thankfully I am just on the edge of remembering the good days of the M25 when you could get round it without stopping at most times of the day. The little MAN was up for it all. If only there had been more European trips I really would have been in seventh heaven. This was my second truck so perhaps as the whole driving thing and freedom had passed and I was just intent on doing as much work as I possibly could. This was where I adopted the phrase “Long Days, Late Nights” a sticker of which would appear on the doors of all my other trucks. At this point I’m not sure anything could have stopped me loving everyday on the road quite so much. We all love the open road and seeing the world go by through the windscreen otherwise we wouldn’t be doing the job. Getting up to Larkhall in Scotland three times a week and reloading from Newcastle-upon-Tyne back to Essex and Suffolk, it was awesome. How much I picked up on these trips from old hands who really had been there and done it and are probably still doing it! For me part of the job was the people you met and what you could glean from them. These days it drives me nuts that the majority seem to park up and go to bed or plug in their Playstations. When I did park up I’d get out the cab and go and find a like minded person to spend the evening with and chat. You could learn new routes, new ways to do things, even learn about delivery points, all info that isn’t written down but is (for want of a better phrase), driving folklaw. A new one GW!. All this just made me love the job I loved even more. What wasn’t there to love?? and ontop of all I was making money. Good old days indeed. I’d spend my money on what I thought were decent accessories for the little MAN. I think it started with a box full of lights and stainless steel from the then biggest name in the USA, Panelite. Then came new stainless steel rear door hinges, handles and brackets. A set of Speedline alloy wheels from Tyretracks of Eccleshall. Always Michelin Tyres. I know some of you even remember the “barbers pole” I painted on the prop shaft?! and so it went on. I’ve always been of the mentality that the truck is what sells my company to those who don’t know me. Definitely the case when the airbrushed Atego came along. I like to think the truck wasn’t over the top but showed that I cared for it and in turn cared for people’s cargo. 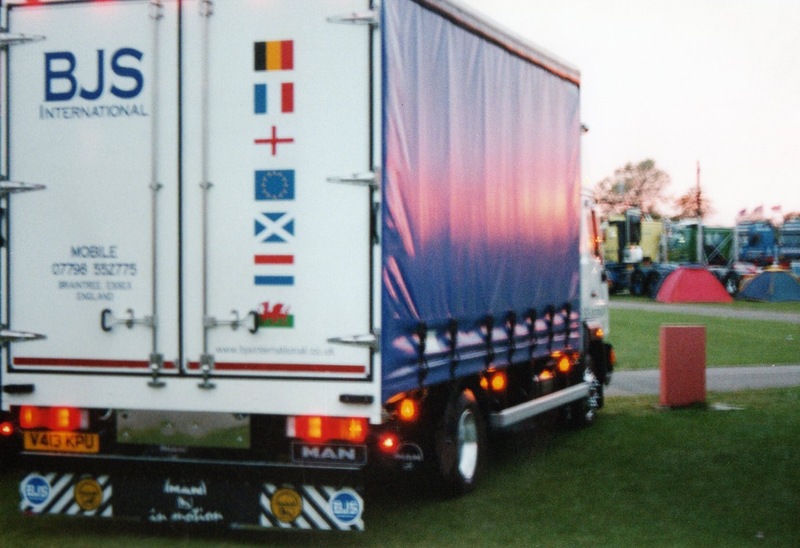 Regular cargos of sunbeds, to tail lifts to computers and farm machinery. Often with comments on how smart the little truck was. Add everything together and I think it’s fair to say that you can see why these were my own golden days. 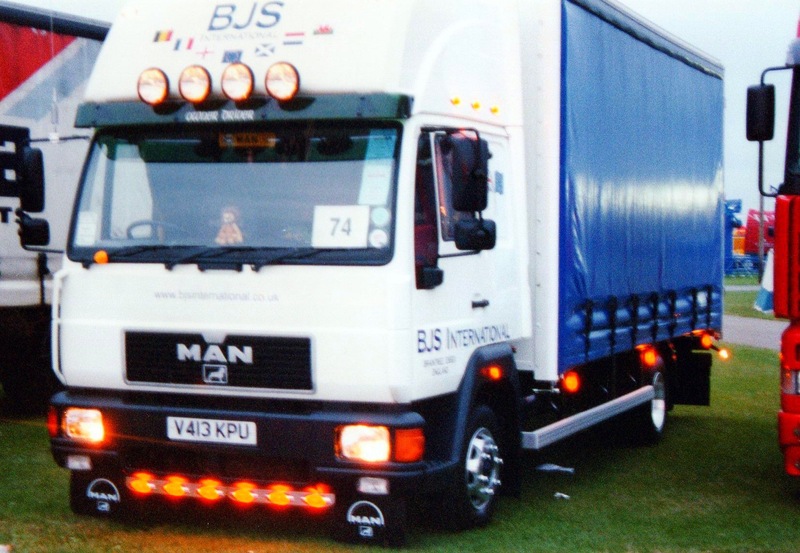 At the end of the day I was young, successful and driving what I thought was the best looking 7.5 tonner in the UK, apart from Frank Hudson Transport of course! Well what more could a non-driving ex lorry driver want for his 38th birthday?!!? Yep your right I’m easily pleased. A little birthday treat from top blog contributed Steve Marsh and his delightfully gorgeous little MAN Hotel on wheels. Thanks Steve a much appreciated bday treat. Once again I got trumped on a bank holiday weekend by Mr Marsh! 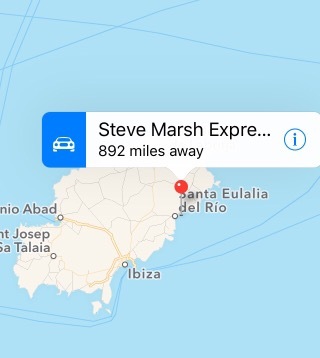 At the beginning of May Marshy spent the bank holiday on the delightful island of Guernsey In the English Channel and then last weekend for May’s 2nd bank holiday (UK bank holiday) he was back on the white isle in the Spanish Mediterranean…….Ibiza. – Load Sunday Evening Nr Spalding, GB. 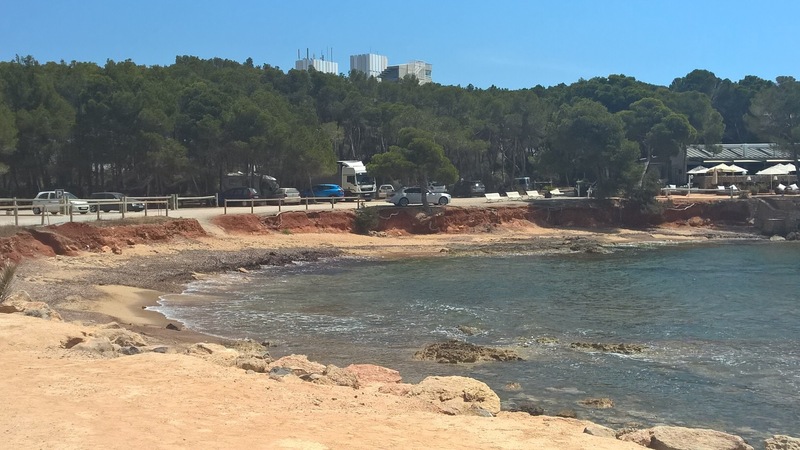 – Catch the ferry Tuesday night from Barcelona to Ibiza. – Tip & ReLoad Ibiza Thursday. 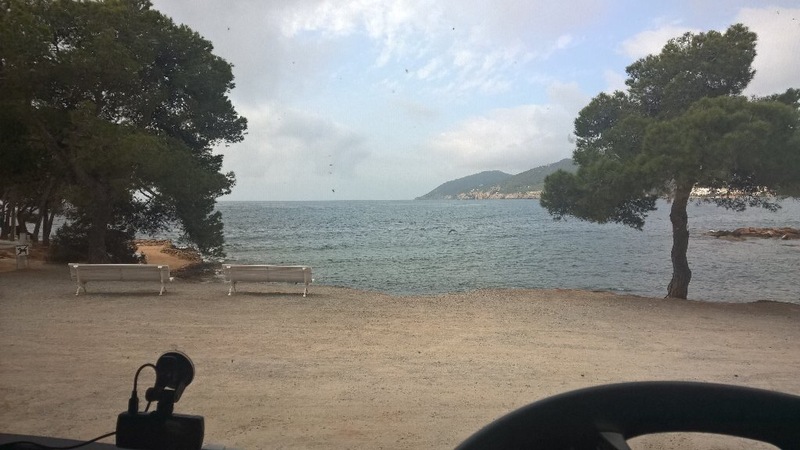 – Catch the ferry from Ibiza to Barcelona Friday daytime. – Deliver back to near Spalding, GB Sunday afternoon. 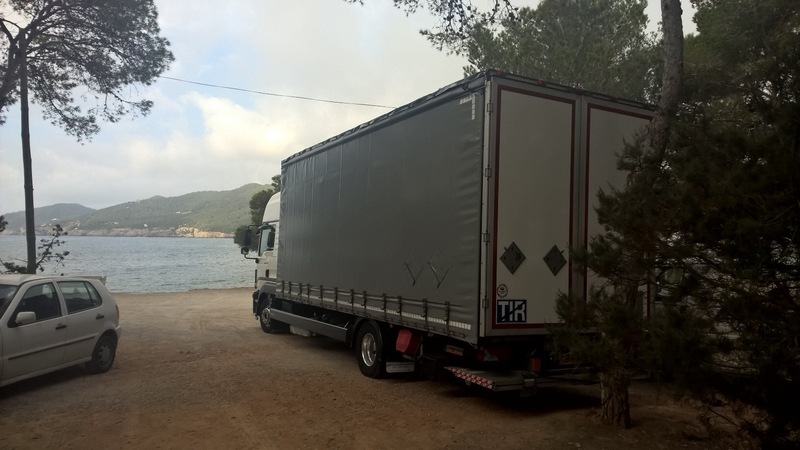 Last August the little MAN delivered down in the south of Ibiza, This time around it was a tip and load in the North East of the island. Surely that is the mark of logistical excellence? Tip and load at the same place on a Mediterranean island? The stuff the romance of the road is made of! Although I have to say keeping an eye on Facebook there are a load of UK people out and about at the mo, Iceland, Ibiza and Sardinia to name a few destinations. Perhaps the UK transport scene is moving into the specialist market more and more, hence the more exotic locations?! I’m sure Marshy has definately spent nights in far less glamorous locations with far worse views! 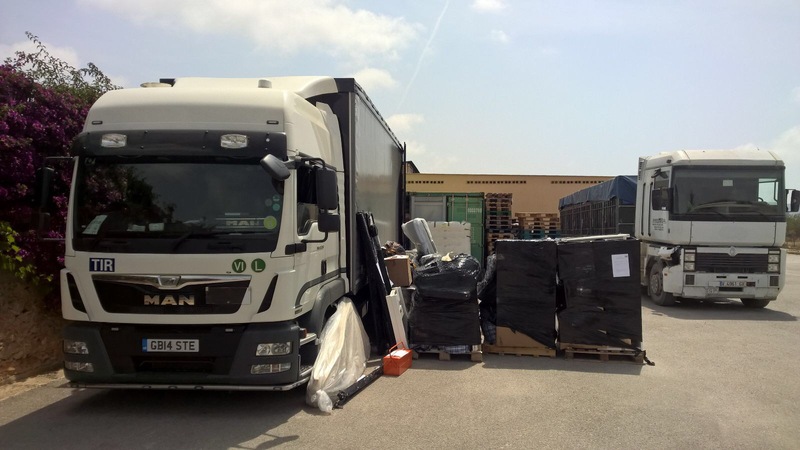 Oh life on the road, if ever a Destination Doha phrase should be applied it should be here; “The sun never sets on a long distance lorry driver” – Well if ever it did, that is the place for it. Look at me getting all romantic, hmmm more like missing life on the road to be fair. 8 years off the road and I still miss it, so please keep sending your pics and stories. If anyone else wants to write a diary piece or anything please feel free and then email me words and photos or like Marshy, you can send details and photos and I’ll do the words. 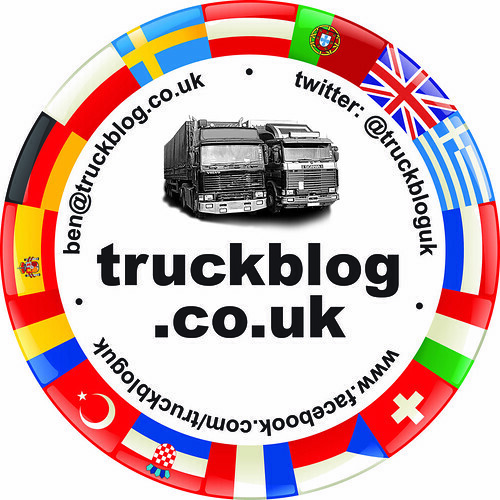 My email; ben@truckblog.co.uk – come on get emailing you’ve all got a story to tell. Can’t beat a little truck with a big cab! 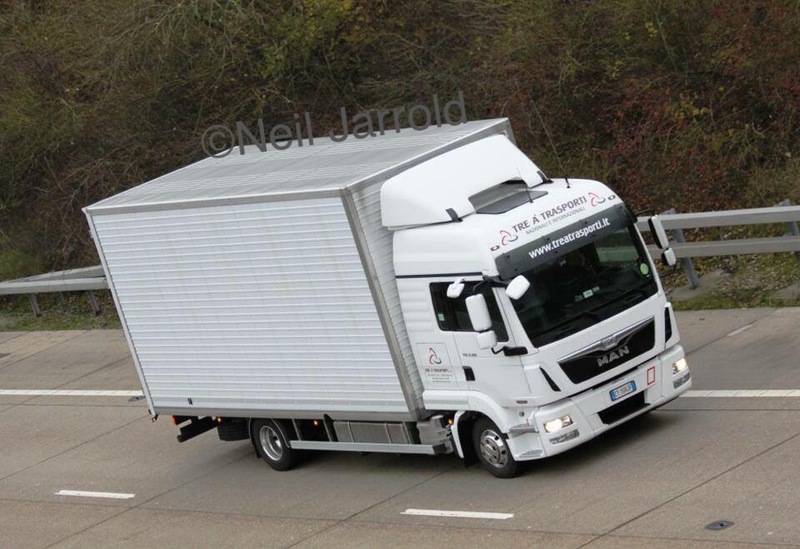 I’ve long been a fan of a Space cabbed 7.5 – 12 tonner, whether it’s an Atego, a DAF or the delightful MAN TGL. 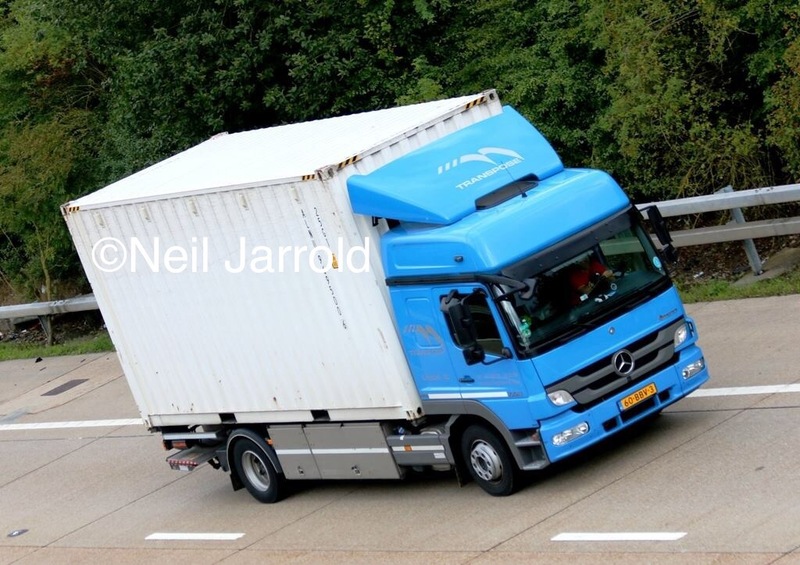 Having run both a MAN and a Mercedes myself, it’s very difficult to pick a winner between the two, they are both great trucks and full of big truck feel. 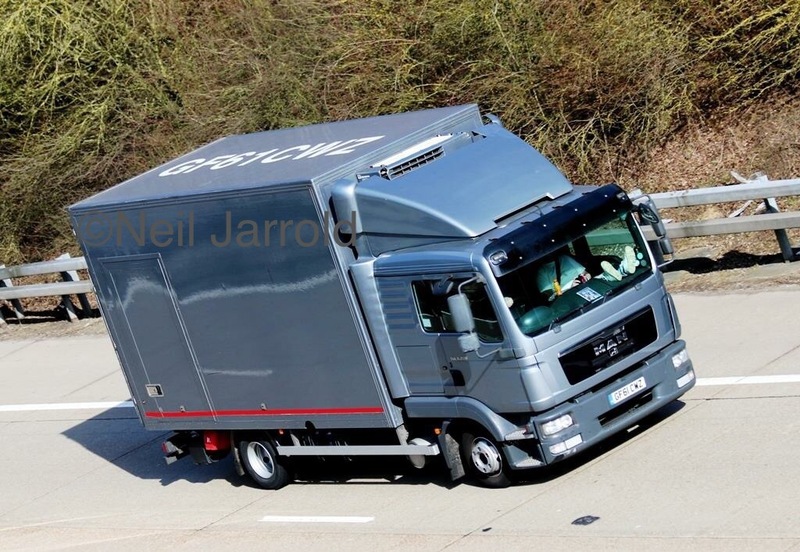 The likes of DAF don’t do their own big cab but the Hatcher Components conversion is very good but isn’t factory finish and then there’s the Iveco. Anyway back to the little truck in the photo, you’ve probably seen it at one of many Truck Shows last year where owner Brian Hill picked up more than a couple of decent trophies including a number of 1sts. 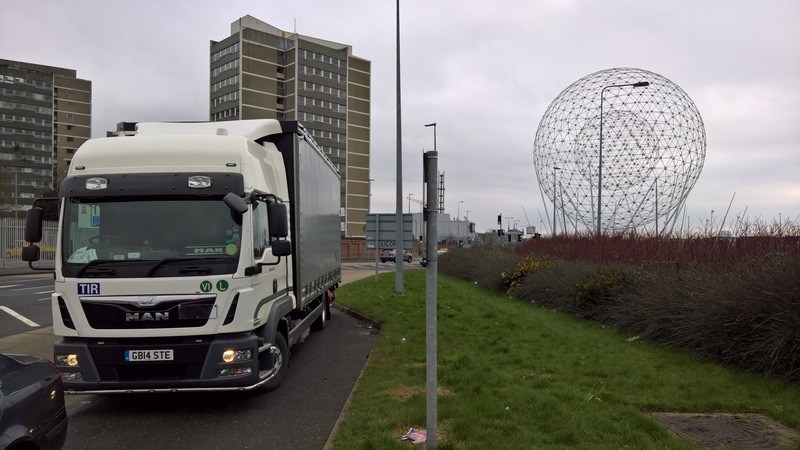 I’ve been trying to get to see the truck for a wee while now and of course meet Brian. 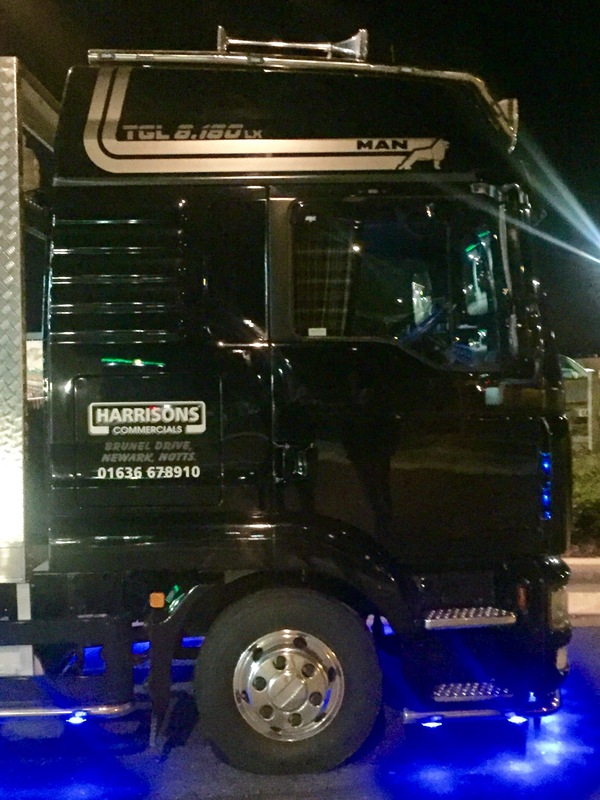 The truck is used by Harrison Commercials to collect and deliver vans to and from auction houses and the like and their Newark base. 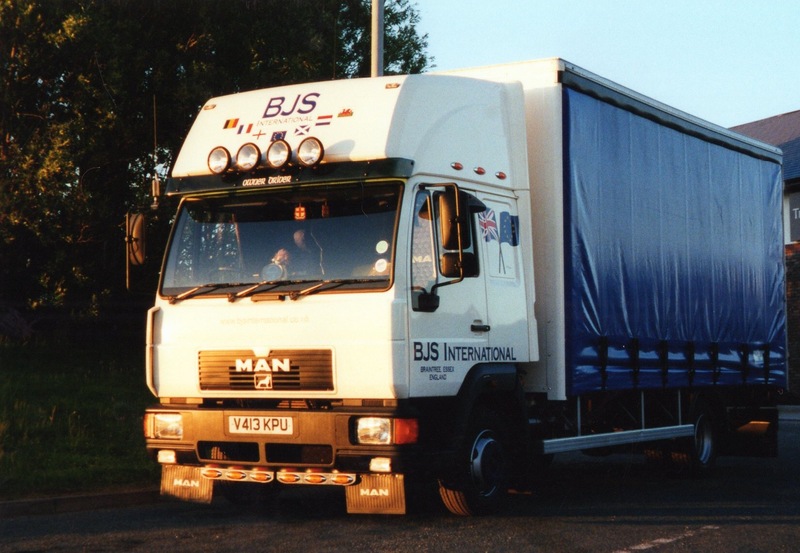 The truck was once a boggo standard TGL LX with a matching black box body. 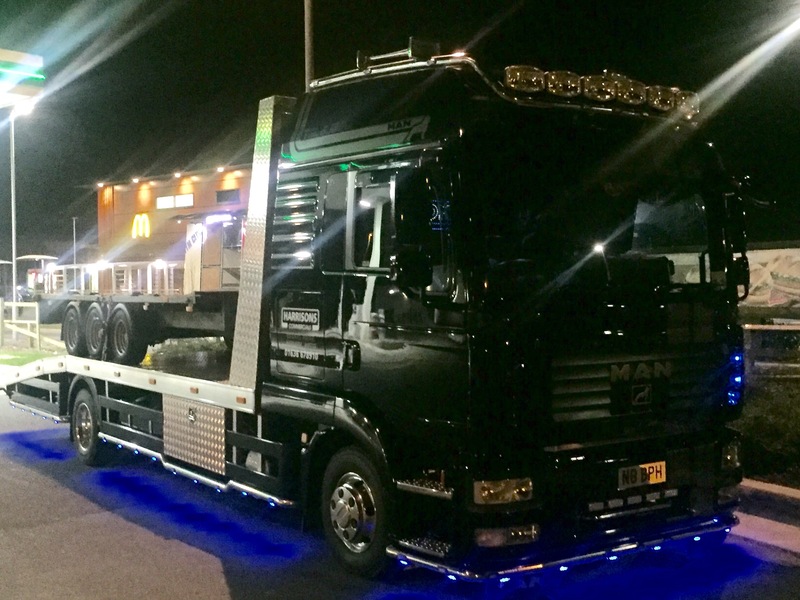 Fancing a new challenge and a change from the Italians Brian bought the truck and soon set to the bodywork. 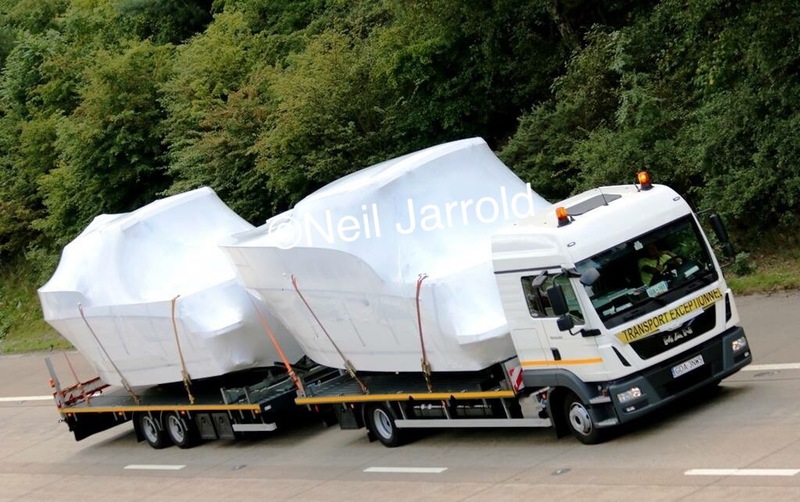 A local chap put together a fag-packet proposal for the beavertail bodywork and feeling brave Brian said yes! If you get a chance to look at the body it is a masterpiece in cutting and welding. 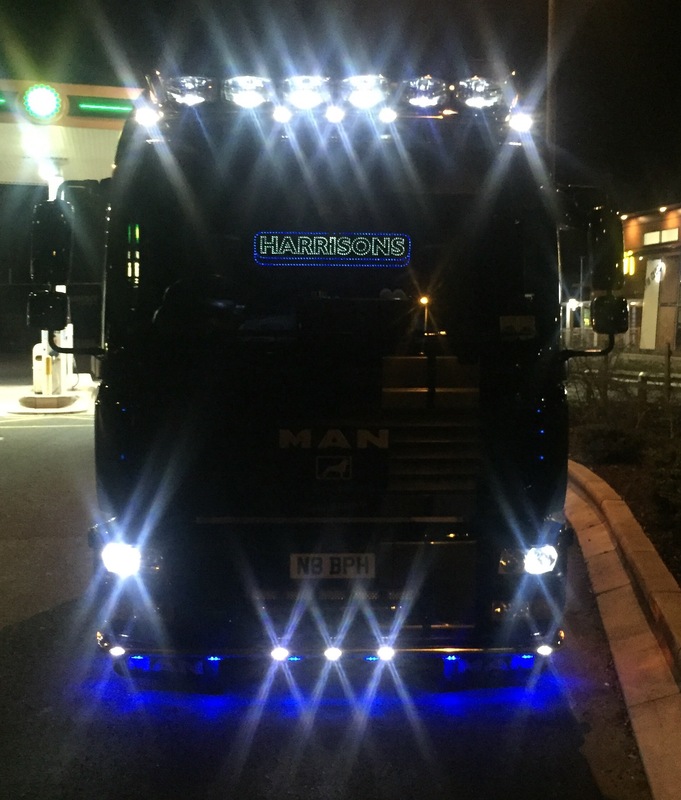 As for the rest of the outside, a whole host of marker lights, spotlights, home made half shaft covers and some custom made graphics. The full set of light bars down the down and round both the top and bottom of the can were custom built by Jimbars. 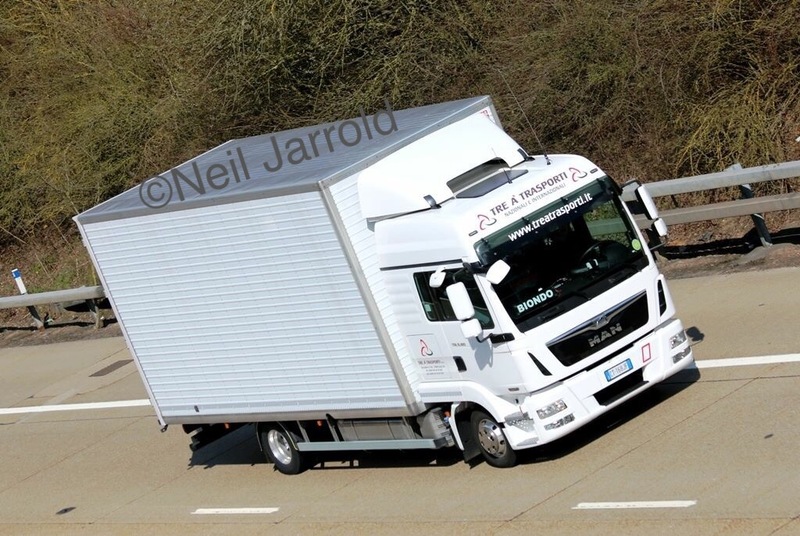 A small one man band is Jimbars but he does seem to be a favourite with the owner drivers, having even supplied a few bars to other MAN TGL ambassador, Steve Marsh Express. I have to say the exterior of Brian’s little MAN is one thing but oh the interior is something else. My photos are rubbish and just don’t do any justice whatsoever to the one off, cosy black leather lining that luxuriate the little German. You’ve got to see it for yourself! Door cards, quarter lights behind the main Windows, the seats, the fridge, the engine tunnel, etc etc have all being given a very gentle covering of black leather to match the outside. 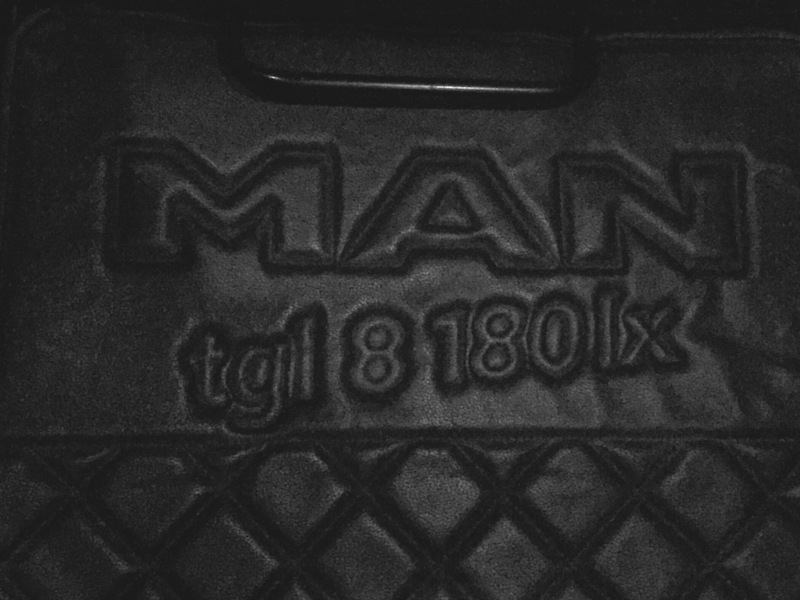 Wanting something different a shoe maker friend of Brian’s suggested just straight diamond padded panels rather than the big button leather interiour that is fairly common place in custom trucks. I have to say once again the subtle approach wins my vote. 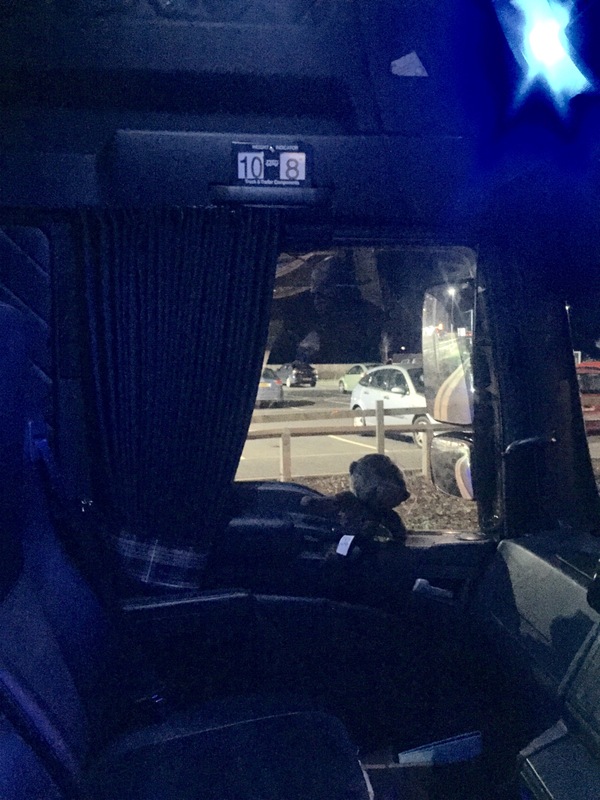 I know it was dark and wet when I met Brian but not only did sitting in the pilots seat make me want my own Tonko Toy again but it just gave up that classy cosy, could-drive-all-night feeling. The whole thing edged a lovely set of Tartan curtains with blackout insides, perfect a for night out now and again. The engine tunnel that is pictured above was stitched free hand by the afore mentioned show maker and what a unique job he has done, Brian is rightfully well chuffed! Great bloke and great truck. 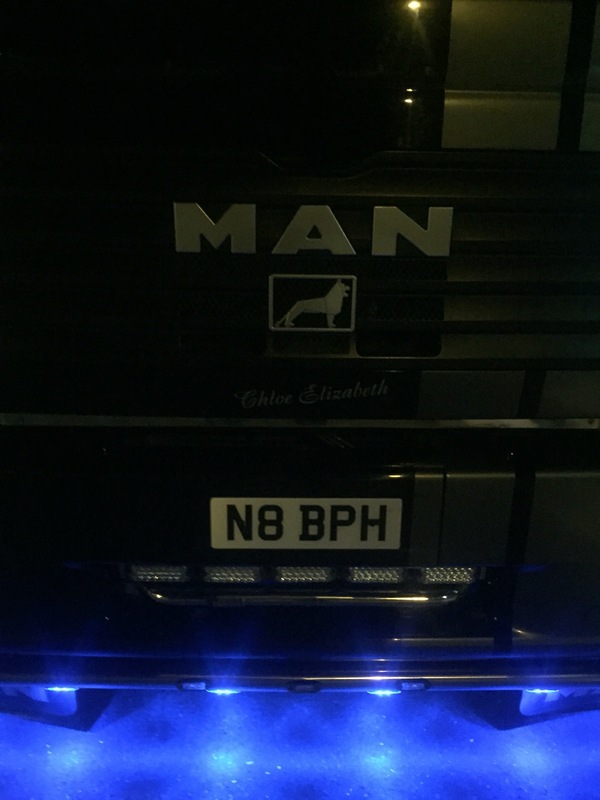 The more time I spent round the both truck and driver the more I liked them, so I had to leave Brian to his cosy night out in the leather luxury of N8 BPH. 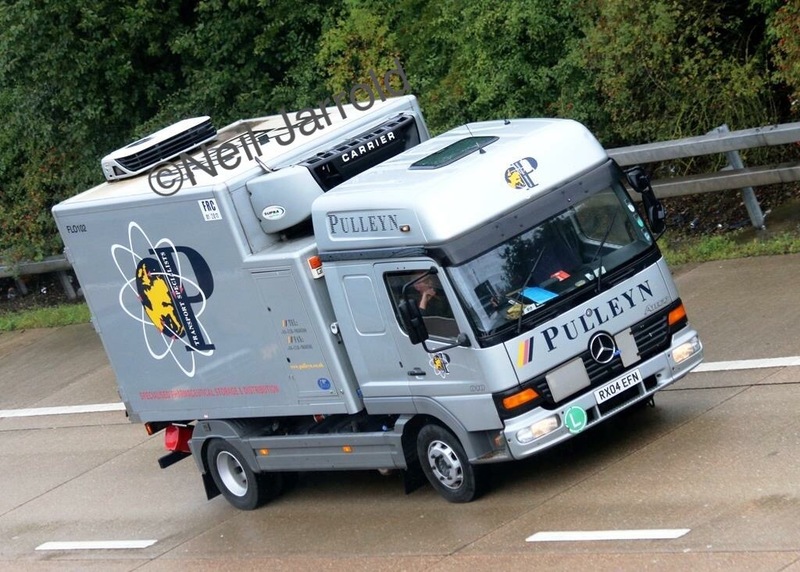 There might not be quite as many show appearances this year but if you get the chance, this truck is as good as any of its big brothers on the show circuit. It’s individual, unique not to mention very subtle and you definitely won’t find a better polished cab in the UK!